Recently Edwards Rail Car Company has relocated its operation to space leased from Kershaw Manufacturing in Montgomery, AL. 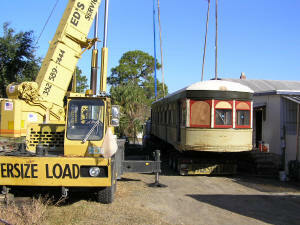 Making its way to the new facility for restoration was former Texas Electric (TE) interurban car No. 305, shown (below) being loaded on the transporter for the trip to Alabama. No. 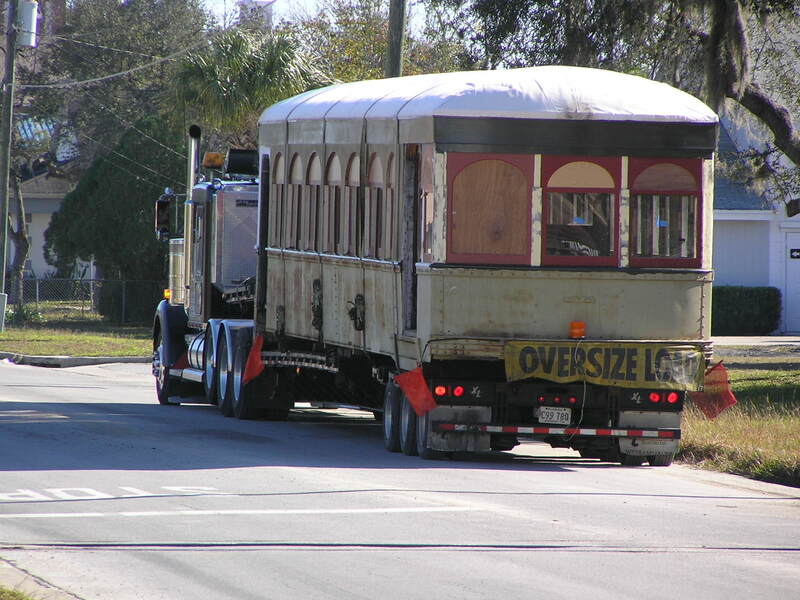 305 being loaded on transporter for trip from Florida to Alabama.� All photos by Steven Torrico. No. 305 was one of 20 cars built by the St. Louis Car Company, originally for the Southern Traction Company in 1913, and then went to the TE in 1917. In the early 1930s the complete roster of these cars were "modernized" with added sheet metal, the removal of the curved upper sash windows, and general removal of the "teens" appearance. The TE ceased operations in 1949 and the cars were retired to different fates.� No. 305 did lengthy service as a residence before being acquired by the city of Corsicana in 2004 (joining a handful of surviving TE interurbans), and Edwards was contracted to do the restoration. No. 305 with trucks sitting outside the facility in Montgomery (above top), and inside picture shows canvas roof (above lower). The restoration is now well underway and when completed 305 will be the only example of a Southern Traction/TE interurban in its "as built new by the St. Louis Car Co." configuration. Edwards will ship the finished car to Corsicana for static display in the downtown area, where the interior will be open to visitors.